Even in the beginning of later half of last century it was a distant dream for youths of this region to get college education because of poverty and as the colleges were located in distant cities. 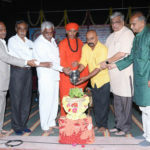 Knowing that pre university education is the gate way to higher and professional education and to fulfill educational demands of the rural poor Sri Raghavendra Swamiji started pre- university college in the high school building at Malladihalli in 1972. In the beginning only arts and science combination were offered to the students. But in the year 1978 commerce section was also added to the college. Now the college offers Pre-university education in all the above three combinations (H.E.P.S., P.C.M.B., and H.E.B.A). Provide holistic and progressive education in tune with the latest development in education. Enable students to appreciate and imbibe our rich cultural heritage and values. Develop a spirit of community and service mindedness. Nurture and promote talent in sports and all co-curricular activities. Achieve all of the above with right ambience; the college has good infrastructure and highly motivated, well experienced and devoted teaching faculty who are working hard. The college is housed in its own spacious building. It can boast of well equipped laboratory, spacious reading room and library which has a collection of 11000 valuable books. The college has special lecture hall fitted with C.D projector. Moreover the college is attached to separate boy and girls hostels so that not only students of surrounding villages benefit from it but also the aspiring students of distant regions can also realize their dream of getting college education. Sri T.H Guddappa is the present principal of the college. He is very enthusiastic and highly energetic person. He is leading a team of highly dedicated, devoted and well experienced teachers. The college has N.C.C unit. It is not improper to mention that this year an NCC cadet Kumari Priya Y.H has been selected to participate in the National Republic day parade to be held in Delhi. She has also been selected for the cultural exchange programme. 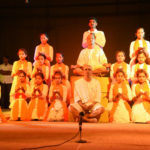 To develop a spirit of community and service mindedness the college’s N.S.S unit organizes yearly camps. Many students of our college have taken part in the state level camps also. Regular and special training in skills of different sports are given to our students. As many as thirty two students represented our college in state level sports meet.